Get ready for close encounters of the “curved” kind. 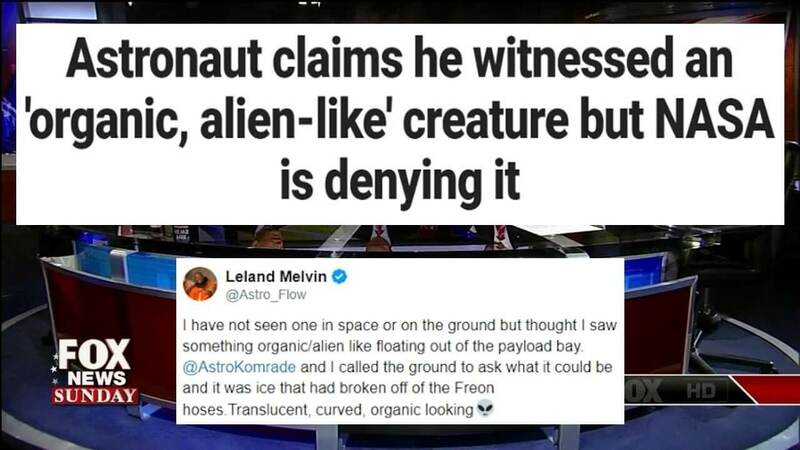 Former NASA astronaut Leland Melvin tweeted that he saw something “curved, organic looking” floating out of the payload bay during his time on the space shuttle Atlantis. He told NASA about it, but the agency told him that what he was seeing was not an extraterrestrial but a piece of ice. “I have not seen one in space or on the ground but thought I saw something organic/alien like floating out of the payload bay,” Melvin tweeted, when asked by the Twitter account UFO Sightings Daily what his thoughts were on extraterrestrial life or if he had ever seen a UFO. Melvin, who played college football at University of Richmond and was drafted by the Detroit Lions in 1985 prior to becoming an astronaut, continued that he was going to say “Houston, we have a problem,” but he did not want to be alarmist. It’s unclear exactly what Melvin, who has degrees in both Chemistry and Materials Science Engineering, saw, but some on social media wanted to believe that Melvin’s sighting was alien in nature, even if he may have been ribbing them. The tweets come at a time when former government officials have suggested that humans may not be alone in the universe. In 2015, Apollo 14 veteran Edgar Mitchell and the sixth man to walk on the Moon said he believed peacekeeping aliens visited Earth to prevent a nuclear war between Russia and the U.S.
Mitchell died in 2016 at the age of 85. Luis Elizondo, a former Pentagon official who used to manage the Pentagon Advanced Aviation Threat Identification Program, also believes we may not be alone. “My personal belief is that there is very compelling evidence that we may not be alone,” Elizondo told CNN in an December 2017 interview. Separately, reports from The New York Times and Politico in late December 2017 claimed the Defense Department secretly set up a program 10 years ago to investigate UFOs. Former Democratic Senate Majority Leader Harry Reid reportedly helped steer money under the program to a donor’s aerospace research company.